Customers are hyper-connected to a wealth of content. Between social media, fellow customers, and marketing campaigns—every decision the 21st century consumer makes is highly influenced. 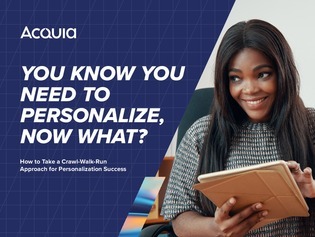 In this e-book, discover how the powers of personalization can help reach those in a customer-empowered world. Gain expert insight from marketing leader, Eric Fullerton, as he unveils his secret 3 step methodology needed to turn any personalization dream into a reality.